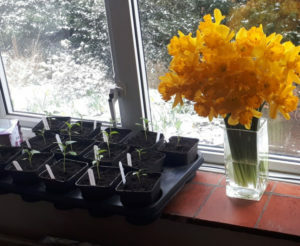 Yes I know you’re anxious to get outside and sow those vegetable seeds, it’s been a long winter and spring is running a good two weeks later this year than last. I too have horticultural ants in my pants (thankfully not red ones). My chillies, peppers, tomatoes and aubergines are as eager to move into the greenhouse as MrsGrow is for them to vacate the living room windowsill. However, rushing headlong into planting everything you’ve got now, without contemplating WHY we have recommended sowing months for specific crops will NOT give you any advantages. Instead it’ll result in disappointment and increased cost through replacement seed sowing. 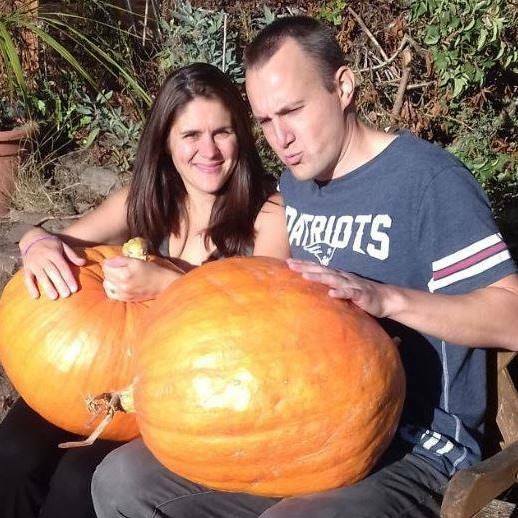 The Facebook forums are full of newbies rushing their seed sowing with tales of seedling woe. If you can have patience, optimally sown seedlings always catch up anyway and in my experience, they provide stronger plants and better crops. Vegetables use daylight to control their resource allocation and timing. Too little (when winter evenings are still dark) and they grow tall and thin (leggy), too much and they might bolt / go to seed for fear of pending autumn months. For example, onions require a minimum of 14 hours of daylight in order for their bulbs to start bulking up – in the UK that begins around 19th April. Up until that point you can plant onion sets but not a lot will happen to them. However, plant onion sets too late and they may bolt before they bulk up. Tender fruiting vegetables like pumpkins or courgettes need 16 hours of daylight to produce their fruit (think June & midsummer’s eve). There is little point in sowing squash seeds in a warm environment in March because you’ll be unable to plant them out and they’re less likely to fruit within their expected 120 day life cycle. Soil temperature is clearly connected to daylight length and heat from the sun. Optimal seed germination temperatures vary by vegetable type. In order to get seeds to grow you need to know if the soil is warm enough for them. This is easier to achieve in a greenhouse, cold-frame or propagator, but outside you are much more dependent upon the weather. 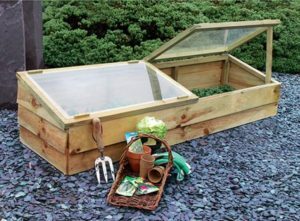 Covering allotment beds with cloches, small plastic grow tunnels or clear plastic sheeting (better for warmth) helps to heat up the soil if you are anxious to get planting out as quickly as possible. As a general rule of thumb, if the soil feels cold to the touch it’s not great for sowing or planting out crops yet. You can of course use a soil thermometer if you want to get an exact measure of soil temperature, I’ve got one somewhere, but I don’t recall ever using it. A good indicator that soil temperature is warming up to a decent level is weed growth, if your allotment suddenly starts to come alive with germinating nettles and dandelions you can be sure it’s worth pressing on with planting out vegetable crops. Are there any vegetables you CAN sow in a frozen late-March? Not Started Yet? Don’t Panic! 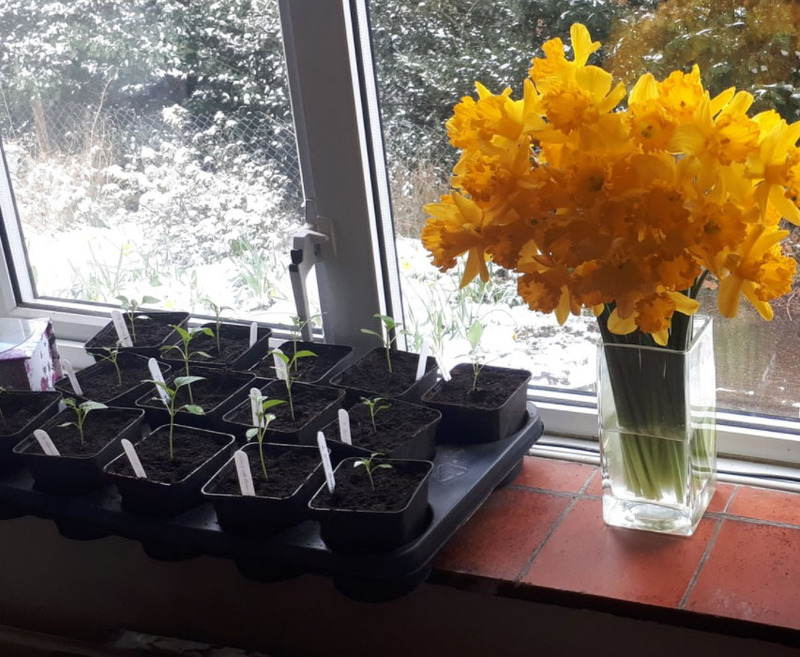 Given that it snowed at the weekend AGAIN and we’ve had overnight frosts for a good few weeks of March, I am not anticipating sowing a great deal before April because the soil is still cold, so don’t panic! Sow some peas, lettuces, cabbages and brussels sprouts before Easter in an unheated greenhouse or cold-frame and they’ll be fine. 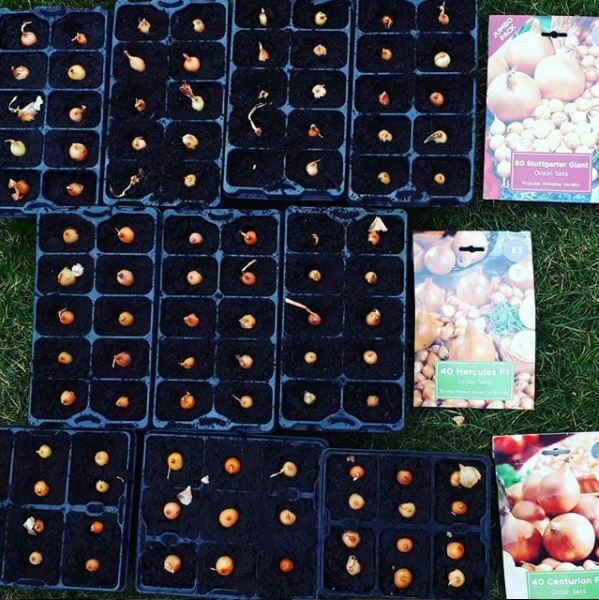 You don’t need to rush onion sets into the ground yet but you could certainly pop them into modules in the greenhouse for planting out later, I find that helps give them a root structure and birds then can’t lift them out of the ground. 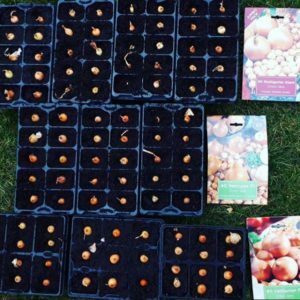 If you haven’t sown garlic yet I’m afraid you have probably already missed the boat there (sow garlic in October or Jan/Feb). If you didn’t get your tomatoes or chillies in yet there is still time for a propagator on a sunny windowsill. It is traditional for potatoes to go in the ground on Good Friday but Easter is early this year and coming off the back of the ‘Beast from the East’ so instead I’ll dig my trenches, layer them with zoo poo manure and cover with plastic grow tunnels to warm them. I won’t sow the seed potatoes until April 15th and I won’t buy them until after Easter, by which time they are usually on 50% sale and already ‘accidentally’ chitted by my local Wyevale Garden Centre. I could sow early potatoes in potato grow bags and keep them inside my unheated greenhouse, that would give them a head start but I find they don’t produce as many potatoes as those planted in the ground so I tend not to bother with that method. If you’re stuck with a patio or balcony you obviously have little choice and need to grow your potatoes in containers. 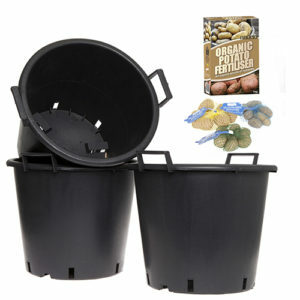 The guys at YouGarden.com have a ‘Complete Patio Potato Growing Kit‘ including 18 Tubers (seed potatoes), 1kg Fertiliser and three 30L Pots for £24.99. It seems to have good reviews. I’m so glad you’ve written this. I haven’t sowed a dot this year other than onion and gardening sets. I generally go by the “don’t cast a clout til may is out” rule.